Runners were not the only ones eagerly anticipating the 2017 New York City Marathon. Businesses along the marathon route embraced the financial advantages of New York hosting the world’s largest long-distance running race. The potential consumer value of 50,000 runners and 2 million live spectators presented a lucrative opportunity for a diverse array of local establishments. The race has an economic impact for businesses, from high-end running clubs to small local breweries. On a bustling corner in Williamsburg, Brooklyn, the owner of local whiskey bar The Gibson already planned to make the most of the bar’s fortunate location on Marathon day by hiring a DJ and crafting a menu stocked with drink specials. The bar has been a hotspot for marathon spectators since 2013, when owner Megan Giometti was first approached by a disc jockey about playing live music for Marathon Sunday. At first, Giometti was apprehensive about the impact it would have on her otherwise quiet, unassuming bar. 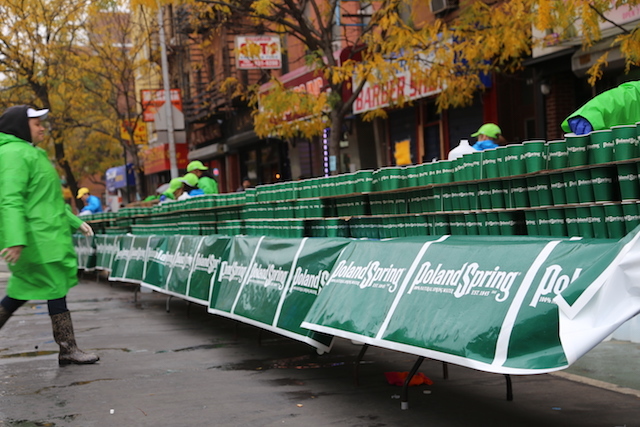 The bar is located on Bedford Avenue, just a few steps in front of the marathon route where spectators gathered to cheer on the racers. Every year, The Gibson opens its doors a few hours early to accommodate marathon viewers on the street. The Gibson is one of the countless businesses which opened early to cater to the avalanche of new patrons for marathon Sunday. The marathon supplied more than $415 million in economic impact in 2014, according to a study that was commissioned by New York Road Runners and released in 2015. It’s a monetary opportunity for businesses across the five boroughs. Some businesses have been earning profits from marathon participants months before the start of the race. Mile High Run Club, a high-end group treadmill studio with two locations in downtown Manhattan, offered a marathon training package for participants looking to formally train and get into shape. “I really was looking for a running community because I found the long runs to be so daunting alone,” said Jacqueline Hancox, a six-time marathon runner who had been training with Mile High Run Club since July. The four-month program, which cost $499, included triweekly meetups led by Olympians. For Hancox, the price tag was well worth the personalized strategic advice, easy access to coaches and injury prevention. The boutique fitness studio also offered indoor group treadmill classes and private training sessions for the marathon. And those who needed a cold beer after crossing the finish line were in luck. In the burgeoning neighborhood of Astoria, Queens, SingleCut Beersmiths had been experimenting with a beer exclusive to the occasion: Miles Marathon Session IPA. “Runners love beer, especially after a big run,” said Dan Bronson, general manager at SingleCut. “The biggest thing the body craves after a run is salt, which is a natural brewing component,” he added. SingleCut’s Miles Marathon Session IPA was distributed to several bars along the marathon course before the premier event.